Under the direction of its Chief Conductor Alexander Liebreich, the National Symphony Orchestra of Polish Radio (NOSPR) is the leading ensemble in the country and is one of Europe’s major radio orchestras. As cultural ambassadors with a rich tradition, the orchestra has made its mark through performances of Polish composers, as is impressively documented in the three-part CD cycle that features works by Karol Szymanowski and Witold Lutoslawski and was released by Accentus Music between 2015 and 2017. 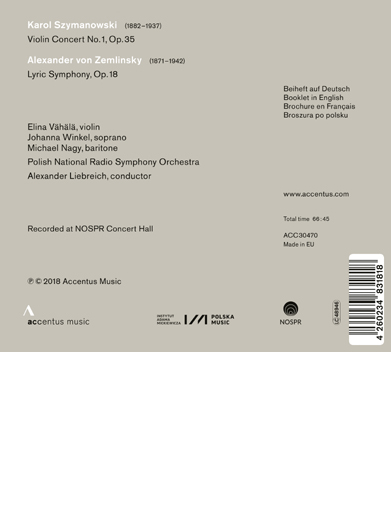 On this new recording, Karol Szymanowski‘s Violin Concerto, played by Finnish violin virtuoso Elina Vähälä, is paired with the impressive Lyric Symphony of Austrian composer and conductor Alexander von Zemlinsky that builds a bridge between lyric poetry and the grand orchestral symphonies. The excellent soloists of this recording are Johanna Winkel, soprano, and Michael Nagy, baritone.